It is hard to keep up with all the different diets and food intolerances these days. We all know someone who is vegetarian, has a nut allergy, or is gluten intolerant. But do you know someone who follows the Low FODMAP diet? No, this is not another fad diet and the acronym does not stand for something simple to say, much less understand! As people who deal in food, we thought it would be worthwhile to explain what the Low FODMAP diet is in detail so that if you know someone who follows it (and chances are at some point you will) then you will be able to understand the difficulties they have doing what most of us regard as simple: choosing meals or foods to eat. 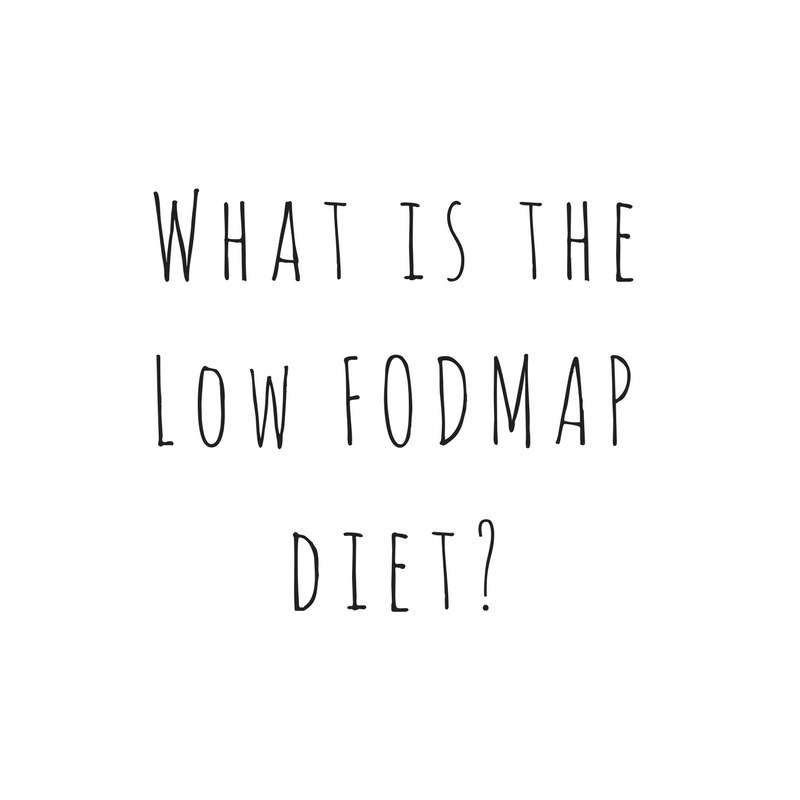 It may also hopefully help some of our followers recognise that they may also benefit from following the Low FODMAP diet, though they may not even know it themselves yet. The acronym in Low FODMAP stands for Fermentable, Oligosaccharides, Disaccharides, Monosaccharides, and Polyols. (I told you they were difficult to pronounce!) So what do they mean? Well, the people who follow this diet are intolerant to these foods, some of the foods to more of a degree than others. According to fodmapfriendly.com these FODMAPs are: ‘a collection of short chain carbohydrates and sugar alcohols found in foods naturally or as food additives. 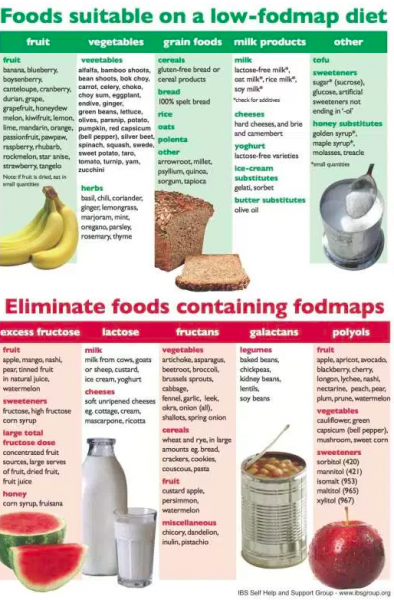 FODMAPs include fructose (when in excess of glucose), fructans, galacto-oligosaccharides (GOS), lactose and polyols (eg. sorbitol and mannitol)’. Or, in my friend’s words who follows Low FODMAP: when she eats foods that contain certain sugars, she cannot process them properly which makes her feel sick. With regard to the fructose and glucose. She can eat foods with fructose if the amount of glucose in that food exceeds the amount of fructose. This is because the glucose helps our bodies process fructose. For example: strawberries are high in fructose but also glucose which helps the fructose be absorbed. When people who are intolerant to FODMAP foods consume those foods, they may experience one of more symptoms of Irritable Bowel Syndrome. One in seven people suffer from this condition and Monash University in Melbourne developed the Low FODMAP diet to help sufferers. The low FODMAP diet has been published in international medical journals and is now accepted and recommended as one of the most effective dietary therapies for IBS. Monash University continues to research foods and whether they are low or high FODMAP. They even have an app (Monash University Low FODMAP DietTM app) that FODMAP followers can use to type in any food they are unsure of to check whether it is Low FODMAP. This is constantly updated as new information comes to hand. For example, even though bananas were seen to be Low FODMAP, recent testing proved that very ripe bananas contain a high amount of fructose and are therefore not. This information has been updated in the app accordingly. Even though there are accepted high and low FODMAP foods, each individual’s reaction to certain foods may vary. The FODMAP diet is different for everyone. It consists of three phases; low fodmap phase, rechallenge phase and adapted fodmap diet. Once a person has moved through each phase of the low FODMAP diet, they will know which FODMAP groups they are sensitive to and of which they need to limit large servings. For example, although honey and beetroot are both on the list of high FODMAP foods to avoid, each person will have their own level of tolerance (or intolerance) to the different foods. So how do you know if you are intolerant to FODMAPs? Well, fortunately FODMAPs do not trigger an immune response or cause damage to the body. This means there are no blood test or biopsies that can identify them. They do however cause rather nasty and ‘unfriendly’ symptoms. The only way to know if a food is causing you symptoms is to move systematically through the three phases of the low FODMAP diet. So once diagnosed, what can a low FODMAP diet follower eat? There is the aforementioned app available, as well as plenty of information on websites. (Please see the websites referenced at the end of this article). As you can see it is quite a comprehensive list. What makes it even more difficult, as mentioned earlier, is that some individuals may react differently to these foods. Some may be able to handle a quarter of an avocado a day, per serve as advised, others may find that they are able to stomach more than that. This is why it is called the ‘Low’ FODMAP diet as some of these foods may be eaten in small amounts. Probably the greatest difficulty for FODMAP followers, other than explaining the diet to others and trying to devise recipes that do not incorporate such a wide variety of foods, is the problem they have when eating out of the home. My friend, who is currently not only eating Low FODMAP but is also vegan and pregnant, as you can imagine, finds this even more frustrating and difficult to navigate than usual. Imagine trawling through your local restaurant’s menu and picking a meal with those limitations! Consider also if you were cooking a meal for someone on a Low FODMAP diet – this would likewise be challenging! I should probably point out, that if these people are suffering IBS symptoms such as bloating, constipation, diarrhea and stomach pain, these are people who probably are in need of support, and a gift of a home cooked meal at some point or another. Through spreading awareness about this intolerance, and having people recognise that it is not just a fad diet, hopefully we can be more helpful to those suffering from IBS and also enlighten some people who may be suffering from the condition but may not have known that there is a way of lessening their symptoms. For customers of The Organic Place, we naturally would recommend when purchasing from our store that you pack your own bag rather than order a pre-packed fruit and veg bag as the amount of FODMAP foods in them will vary from week to week. You are better off choosing the produce that you know you can consume. In conjunction with this article, our next The Organic Place recipe will be FODMAP friendly for our Low FODMAP diet followers or for those who may like an alternative recipe to create for a friend or family member who may benefit from this type of meal. This entry was posted in Blog and tagged Fodmap.